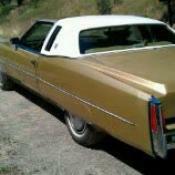 Goldie was special ordered through Sparling Cadillac, Seattle WA in July of 1974 by Grannie Tillie. In 1995, I purchased Goldie since Grannie Tillie could no longer drive Goldie. Goldie has 61,213 miles and is ready for a road trip.